This month at Breathe we will be focusing on saucha, the tenant of purity and cleanliness. Saucha is the first of the Niyamas to greet us at the second stage of Patanjali’s eight-limbed path of yoga. We’ve covered the five Yamas over the last five months and we now shift to the Niyamas, or observances, attitudes directed inwardly that we can cultivate that lead us away from suffering and toward liberation. We often joke in teacher training that saucha, pronounced sh-ow-cha, sounds similar to shower, which is a good way to remember it’s meaning. Just as showers are an act of cleaning our body, saucha is cleansing actions that purify our life. How we maintain our bodies, our possessions and our living spaces are ways that we apply saucha as a living practice. The practices of yoga including asanas and pranayama aim at helping us maintain cleanliness of body and mind. These practices and the incorporation of meditation are ultimately purifying on many levels and are at the heart of a yogis saucha practice. A big part of this journey through life is learning to observe our thoughts and behavior patterns, then choosing to act with pure intentions. An integrated practice of saucha asks us to look at how we maintain cleanliness in our environment, cleanliness of our body, as well as cleanliness of mind. Saucha is the living embodiment of a clean, pure lifestyle. We aim to purify on all levels from action to thought. It may be impossible to control the mind completely, but perhaps we loosen the minds grip from disturbing thoughts and avoid fostering impure thoughts. A practice of reflection may help us determine where are intentions lie, knowing that our actions spring forth from thoughts, and behaving from pure intention. Integrating purity into our diet is a practice of saucha. Wholistically looking at our lives to see where we may live more cleanly? This level of self-awareness requires courage to be honest and willing to look at our choices; and it’s important to do this with compassion. Always be kind through this process of self-discovery. —Keep your environment clean. Neaten up areas of your home or car that need to be organized, keep the laundry from piling up, and stay on top of household chores that will make you feel like you live in a more tranquil space. —Spring clean your home, this may be the perfect time to purify and put a deep clean on your living space. —Choose to be conscious of what you put into your body and your consciousness. What we put in is equal to what we get out. Our diet can help us sustain optimal health or deplete our vital energy. Additionally, the input of data that is harmful, violent or impure, such as imagery from tv, even books, or other forms of media can plant seeds of unclean virtues and produce negative emotional states. —Take a look at habits that don’t feel healthy, or make you feel less than your best. For example, Are we staying up too late? Depleting our life force energy. Clean living includes ample sleep. —Observe your thoughts. A meditation practice can help purify and retrain our mind from randomization or attaching to thoughts that make us feel greedy, selfish, or angry. —Consider a detox. 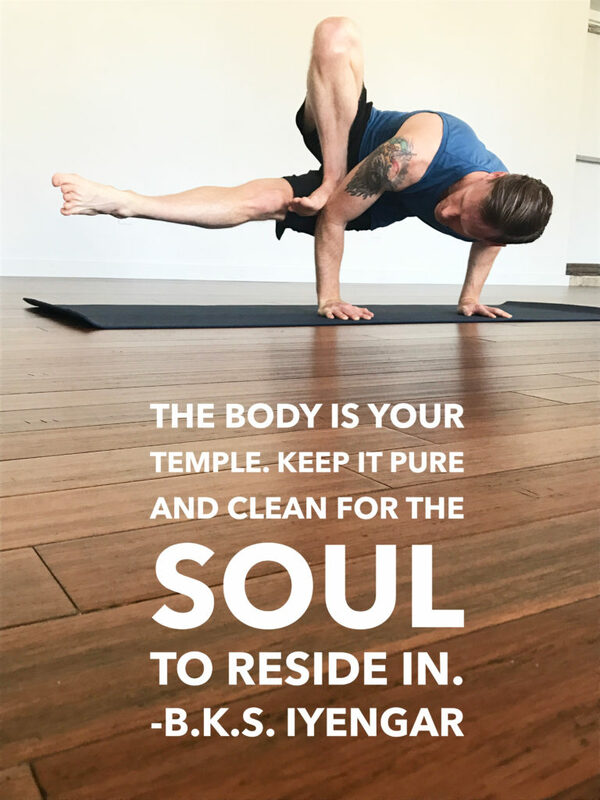 Just as we do an periodic deep cleans of our environment, a deep clean of the body’s internal system may help the natural purification processes so we are refreshed and revitalized. The habits we pick up throughout life on or off the mat may or may not serve us. Yoga and meditation offer us insight into whether or not our thoughts or actions are improving are quality of living, as well as the lives of others. When we look at our patterns and actions a healthy dose of impartial reflection can move us toward cleanliness of being. Is this a healthy choice? Does this benefit more than just me? Distilling the answers to these simple questions may or may not be painful, but certainly guides us toward a life of cleanliness. I hope this focus on saucha is helpful to you. Maybe it’s time to clean up our act, and in so doing, clean up our life.